A typical Christmas Day is warm and cosy with us surrounded by our family members and our gifts ready to be unboxed. Unfortunately, this not the case for the refugees in Calais seeking comfort on a frosty day with the hope of a better life beckoning. The day brought welcome relief with some warm food, but they were seeking a little more in terms of compassionThank that only an NGO could bring them. It was a sight to witness that on a day this cold, some had as little as a sweater and socks worn with sandals. 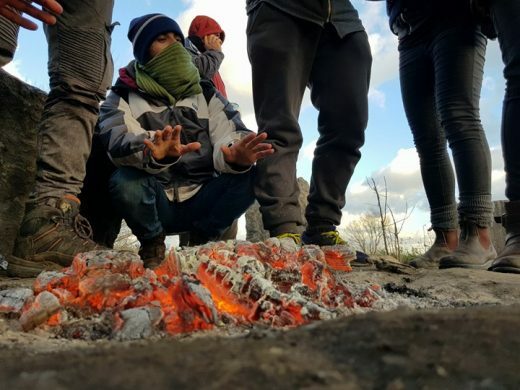 The Care4Calais team conducted two distributions on Christmas Day – the first was for a mix group of Eritrean and Ethiopian refugees where we gave out sleeping bags and food packs and the second for a smaller group of the Afghan refugees that we handed out much needed fire wood to supplement the fire that they had already started to keep warm. It was a special Christmas for us volunteers. Despite being away from home and our loved ones, we took time out on this special day to pay tribute to a wonderful day of giving to our fellowmen who are seeking a better life than they left behind. In the spirit of fellowship, we were gathered around the fire with the Afghan refugees, to talk about their hopes and dreams to be reunited with their kin in the UK. Out of compassion, our leader Sam offered his mobile phone to a refugee to call his family at home to check on their well-being. The smile of gratitude was obvious and true. Much can be said about how a small act of kindness can bring warmth on such a winter’s day. Before we left them that evening, it was great to see their spirits lifted by our visit and some semblance of hope restored. I hope we made an impression that human compassion still exists. For all who read this post, if you want to do something great, come spend some time with us in Calais and experience a great opportunity to do some good for someone you may not know. Alternatively, help the passionate people at Care4Calais continue their tireless work with a donation today.